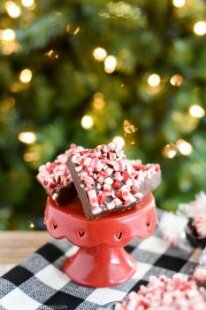 Easy 5-ingredient peppermint fudge recipe. This peppermint fudge makes a great food gift for neighbors, friends, co-workers, and teachers for Christmas. With the holiday season upon us it’s time to gather in the kitchen for home cooked meals and holiday treats with Christmas music playing in the background. Over the last few weeks we’ve been working on new peppermint recipes to add to our holiday favorites collection. It seems like the closer we get to Thanksgiving the more we start baking up a storm and I know that will only increase the closer we get to Christmas. My son is a big fan of peppermint bark so we usually make as many peppermint recipes as we can before the season passes. I try to make different variations of classic treats inspired by peppermint bark, like peppermint brownies and peppermint bark cheesecake dip. Today I’m sharing this easy 5-ingredient Peppermint Fudge recipe made with and peppermint chips. I’ve often shared with you my childhood memories in the kitchen with my mother and sister. One I can very clearly remember is asking my mother to help me make fudge. I started checking out cookbooks from the library in elementary school and I remember one day I came across an easy fudge recipe in a cookbook and knew I had to give it a try. It was a big hit and since then I’ve made it nearly every single year for the past 20 years. It’s become a family favorite that my sisters always look forward to receiving around Christmas time. I usually make a batch for our holiday gathering then make a separate batch to give away. Last year we made several batches of rocky road fudge for our neighbors. Grease 8x8 inch baking pan. Optional: line the bottom of the pan with parchment paper for easy removal. 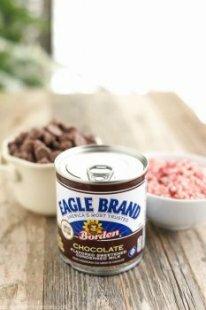 In a medium saucepan, warm chocolate chips, butter and sweetened condensed milk together. Stir over low heat until chocolate is completely melted.